The Osaka Prefecture (Ōsaka-fu) is one of only two urban prefectures (fu) in Japan, the other one being the Kyoto Prefecture (Kyōto-fu). 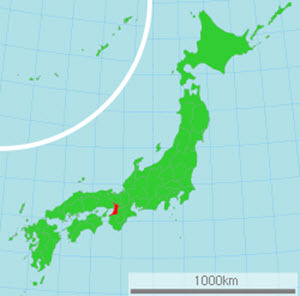 The capital of the Osaka Prefecture is the city of Osaka, which is a part of the large urban Osaka-Kobe-Kyoto area. Located within the Kansai region of Honshu, Osaka borders to Osaka Bay to the west. This bay is a part of the Seto Inland Sea, a body of water connected to the Pacific Ocean by narrow channels and straits. The Osaka Prefecture used to have the smallest land area of all the prefectures, but in the early 1990s a artificial island was built to create space for a new airport (Kansai International Airport) and this added enough land to the prefecture to make it slightly larger than the Kagawa Prefecture. The official symbol of the Osaka Prefecture is known as sennari byōtan (“thousand gourds”). It used to be the crest of Toyotomo Hideyoshi, a 16th century daimyo and general who brought an end to the Warring Lords period of Japanese history. In 1583, he ordered the construction of the Osaka Castle, which would continue to be a very important stronghold for his clan even after his death. The capital of the prefecture is Osaka City (Ōsaka-shi), which constitutes the largest component of the huge Kyoto-Osaka-Kobe metropolitan area. This is the second most populous metropolitan area in Japan; only the Greater Tokyo Area has more residents. Osaka City developed where the River Yodo reaches Osaka Bay. This waterway connection turned Osaka into an important trading point, and the city still has a comparatively high number of wholesalers and retailers. Examples of important trading districts in the city are the wards of Chuo and Kita, which combined are home to well over 16,000 shops. The nation’s longest shotengai is found in Osaka; the 2.6 km long Tenjinbashi-suji arcade. Toka-Ebisu, held at Imamiya Ebisu Jinja on 9-10 January. The Osaka Asian Film Festival in March. Shoryo-e, held at Shitenno-ji on 22 April. Aizen Matsuri, held at the Shoman-in Temple on 30 June – 2 July. Tenjin Matsuri, held at the Ikukunitama Shrine on 24-25 July. Sumiyoshi Matsuri, held at Sumiyoshi Grand Shrine on 30 July – 1 August. The Osaka Prefecture has the largest Korean diaspora of any Japanese prefecture. Many of the ethnic Koreans that live here belong to families that have lived in Osaka for several generations, since many Koreans migrated to Osaka during the Japanese rule of Korea (1910-1945). From 1922, a ferry line ran between Osaka City and Korea’s Jeju Province, bringing many migrants looking for work in Japan. Also, Japanese authorities forcefully made ethnic Koreans relocate to Osaka during WWII.